In my last two Saturday Snapshots, I shared photos of celebrity sightings at the Wizard World Convention. 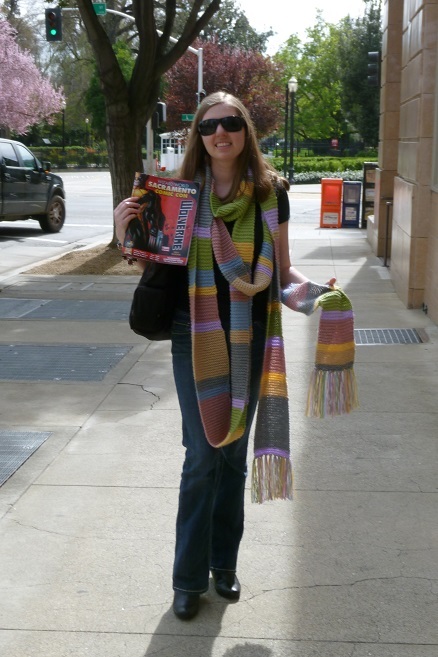 No more celebrities this week, but I have been promising a picture of my completed Doctor Who scarf being worn…and since I wore it all day at Comic Con (and never tripped!–so proud), it was a perfect photo opportunity too. Oh the life of a fan! What a fun event and a very cool scarf … how long is that thing ????? Your scarf looks great! I tried to knit a shorter one once, but never finished it. Your scarf looks great. Very cool. Your scarf looks fantastic. I’m sure you had a great time at comic con. What fun! Love the scarf. Your scarf is amazing. It looks great on you! Great pic! Love the scarf & sunglasses combo. You look like a model. Did anyone at Comic Con get the significance of the scarf? Great scarf. Love the colour combination. Did you make it yourself? OOOOOOOH. That scarf looks amazing on you!